Re: Your drawing and Creation. Hehe Thank you very must-a, but im not resgiter in DA, if you are, we can post it (when you do time too), but don't forge i made it ok.
No. Sorry man but the rules are the rules, you just can't post someone else's art on your acount. If you're interested in posting it on DA, make yourself an acount. And no, I can't buy him tacos! 1st : Do you know how much that little guy eats? A LOT! And 2nd : I am busted man! I can't pay for that! But I want my tacos! No Gir, you won't have any tacos until you start behaving like a respectable irken robot! I WANT MY TACOS NOW!!! Weapons of massive destruction activated. Here's a Preview of a comic im making with Megaman 7 Sprites. EDIT: Please Note That you can't see my picture from a CSDM school computer, since the CSDM block my source, imageshack.us. I'll end it in a week or so. shimaritsu wrote: well i made a cross after a readed all 148 first chapter of d gray man and i think i made a good one. Wow, that's really nice! What program did you use? I want names! Give me names! 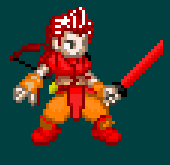 Here's a Sprite Of Vincent Valentine i made by editing an other sprite. Hope you guys like it, cause I know Shimaritsu liked him. linkmac wrote: Here's a Sprite Of Vincent Valentine i made by editing an other sprite. LONG LIVE VINCENT VALENTINE !!!! 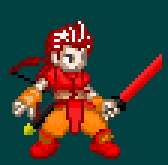 Here's a new Sprite I made by editing an other sprite. On the Left is mine, Fireman. On the right it the model, Geminiman. They all from Capcom, but I'm not sure if the made a Fireman in 16-Bit. Well if you just change the color it easy, the only thing it was hard was to make fireman's helmet. Beside geminiman was the only model who was almost identical as the fireman picture I find to make mine. 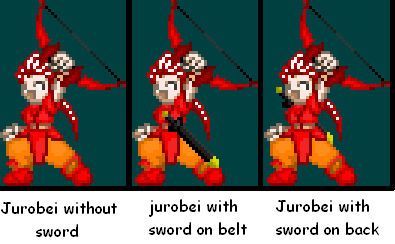 And here's Inferno Character Jurobei Akamatsu in 3 versions, a 4th will come soon. I forgot this one version of the bonus sprite of Jurobei Akamatsu. this one, the sheath of the sword is on his back. linkmac wrote: I forgot this one version of the bonus sprite of Jurobei Akamatsu. You mean the scabbard of the sword is on his back. YAY, I made my first animated sprite with Photoshop . Ok I know there's still the white as background but it was my first try. 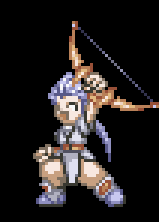 It Erika form Fire Emblem Sacred Stones on the GBA, enjoy. No it the same thing, even in Inuyasha he said it the sheath. Anyway I look in a dictionnary and they had like 4 word for it, and scabbard and sheath was theres so. 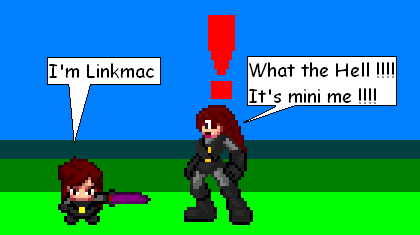 linkmac wrote: Here's a Preview of a comic im making with Megaman 7 Sprites. EDIT: Please Note That you can't see my picture from a CSDM school computer, since the CSDM block my source, imageshack.us. Remember my comic preview here. Yes , well since I kinda forgot this comic I just jump in it now and I made better Background to it . I'll post the comic by parts of 6 square so just wait for my second part and enjoy the first , even thouth you already ready the preview one . linkmac wrote: Like you notice I change this topic title . Why , well it simple , if you made some creation in MS paint, photoshop or anykind of program that you able to draw, you may post here. I'll make one with some Megaman 7 sprite. hope you'll like it. Ok then, I'll post some of my stuff soon. My tallests will be pleased to hear this! Lol you post this reply on the 19th february, and you style didn't send something, anyway i may beem busy with school or you just forgoted. Well about my comic, I'll delay it for a while , cause I don't have time now, so for now you guys need to be patient . linkmac wrote: Lol you post this reply on the 19th february, and you style didn't send something, anyway i may beem busy with school or you just forgoted. Hi guys, I made something new this time. I made an animated avatar of Protoman who's whistleling on a street post. you can't use it without my permission. If someone use it, you'll have trouble with the moderators. Protoman sprite was made by Capcom, but edited by me. linkmac wrote: Hi guys, I made something new this time. I made an animated avatar of Protoman who's whistleling on a street post. you can't use it without my permission. If someone use it, you'll have trouble with the moderators. Awsome, I can see you've improved! Kykywox wrote: Awsome, I can see you've improved! Bah, I'm sure you can! Here's a new animation I made with better movement. It Roy from Fire Emblem The Sealed Sword who's making is critical attack. I made this for fun. 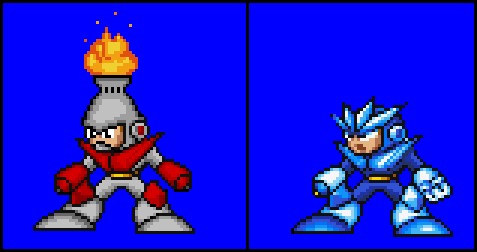 I was wandering how Megaman from the Classic series would look like if he was made in the Megaman X style. SO there you have it Megaman in X style in 16-bit and 32-bit. P.S : My comic is moving slowly, I kinda making one square at the time when I got some time.